I know that everyone of you likes to put a really nice BMW E36 wallpaper on his desktop, so he can enjoy BMW E36 cars even when he’s not behind the wheel. I also know that many of us BMW E36 enthusiasts like to watch the cool BMW E36 cars to get ideas for his next car modifications. BMW E36 vs BMW E46 . . . Which One Do You Prefer? This entry was posted on Tuesday, February 19th, 2008 at 4:36 pm and is filed under E36 M3, Photos, Uncategorized. You can follow any responses to this entry through the RSS 2.0 feed. You can leave a response, or trackback from your own site. Nice BMW wallpaper! Love to see more! what are the exact type of projection headlights have you on the car they look really great. 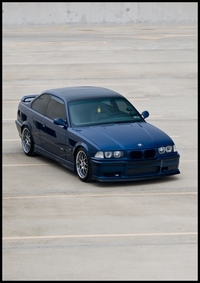 You are here : Home » Avus Blue BMW E36 M3 . . . Great Wallpapers!